Tartlets are so versatile - you can fill them with almost any vegerables and cheese you have to hand. There seems to have been a bit of a proliferation of 'caramelised onion and goat's cheese' tarlets served up as the token vegetarian offering in recent years (which not everyone is fond of...although I'm quite partial to a homemade one made with caramelised red onions and thyme), but this shouldn't put you off! 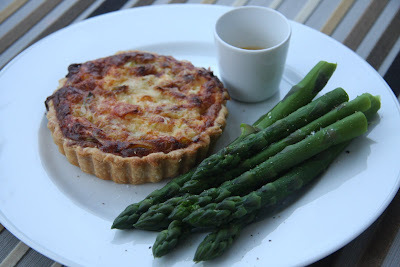 Mushrooms work particularly well with pastry, especially in a thick bechamel flavoured with tarragon, garlic and brandy (like the Crank's recipe for Mushroom Lattice Tart), as does asparagus at this time of year. Other favourites of mine as the weather starts to warm up are tomato with either dijon mustard and gruyere or soft goat's cheese and thyme or fresh peas and broad beans with feta. All of which are great serve hot, warm or cold as part of a picnic. I have made this version using the leek and cheddar combination a few times recently after picking up some lovely farmhouse cheddar whilst on holiday in Dorset. They're perfect for lunch or a light Spring supper accompanied by some English asparagus - especially in this gloriously hot and sunny weather! Firstly make the pastry. Mix the butter and flour together (either by hand using your fingertips or in a food processor) until they ressemble breadcrumbs, then add the paprika / cayenne (if using) and salt. Add the water a little at a time until the mixture forms a soft dough (taking care not to 'over-handle' the dough). You may need more or less water which is why it's best not to add it all in one go. Wrap the ball of dough in clingfilm and refridgerate for at least 20 minutes. To make the filling, start by heating a large knob of butter (at least 1oz) in a heavy based pan over a low heat, then add the sliced leeks. Saute the leeks for around 10 minutes until softened but take care not to let them colour. 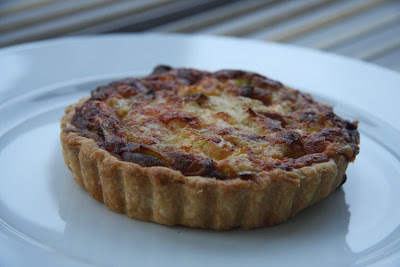 In the meantime, beat the egg and add the milk and cream (or just milk), most of the grated cheese (keep a little to sprinkle on top of the tartlets), mustard a pinch of salt and plenty of freshly ground black pepper. Remove the pastry from the fridge and roll out to line 4 greased fluted tarlet tins. Return the tins to the fridge for 10 minutes (or longer - they can be prepared in advance). Blind bake the pastry cases for around 15 minutes at approx 190 C (depending on your oven). To do this, line the pastry case with a piece of baking parchment and fill the parchment with baking beans (or rice or dried pulses). Then remove the parchment and baking beans and bake for another 5 minutes. 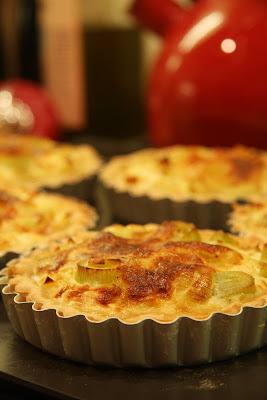 Divide the leeks between the part cooked tartlet pastry cases and then pour over the egg, milk and cheese mixture, taking care to make sure the cheese is equally divided between the tarlets. Sprinkle the remaining grated cheese on top and put back into the oven at approx 180 C (depending on your oven) for 10 - 12 minutes until set and golden. So when I spied some lovely fresh pink rhubarb in my local grocers a couple of weeks ago I couldn't resist. 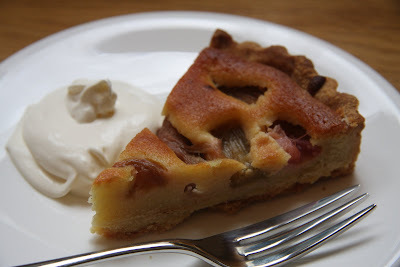 There had been quite a lot of talk of ways to use the new season rhubarb amongst some of my fellow food bloggers (good old crumble, fool, compote, muffins...) and what to match it with. I'm a big fan of stem ginger with rhubarb, especially in a layered fool, but Linda who writes the blog With Knife and Fork mentioned that she'd opted for rose water in her rhubarb fool. After some to-ing and fro-ing with Linda and Jan (The Ample Cook) over poaching methods and rose water I set to making this delicious tart. Make the pastry: I do this in the food processor, but if you don't have one mix the flour and butter in a large bowl with your fingertips until they resemble breadcrumbs, add the icing sugar and mix and finally, beat the whole egg and egg yolk together and add to the bowl. Bring the ingredients together with your hands to form a ball whilst handling as little as possible. Wrap in cling film and chill for at least half an hour. Roll out the pastry to line a fluted tart tin (or several smaller tartlet tins), prick gently all over with a fork and chill again. Blind bake for around 15 minutes at 180 - 200 C (depending on your oven). To do this, line the pastry case with a piece of baking parchment and fill the parchment with baking beans (or rice or dried pulses). Then remove the parchment and baking beans and bake for another 5 minutes. Whilst the pastry case is cooking you will need to poach the rhubarb. Wash the rhubarb well and cut into pieces approximately 1 & 1/2 inches long. Put into a wide based pan or casserole and add the 2 tbsp rose water and 2 tbsp caster sugar (you may want more or less sugar depending on your own tastes). Put the pan on the hob and poach the rhubarb for about 5 minutes. You want the pieces to be tender but not so cooked that they break down. In a clean bowl (or food processor), make a frangipan by mixing the rest of the ingredients together (almonds, butter, sugar, flour and eggs). 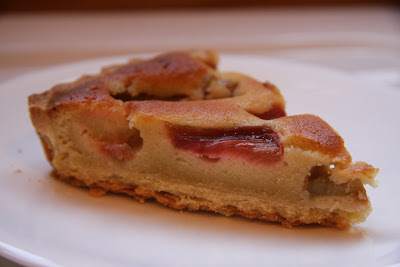 Remove the tart case from the oven and fill with the frangipan mixture. Add the rhubarb pushing it into the frangipan mixture slightly. 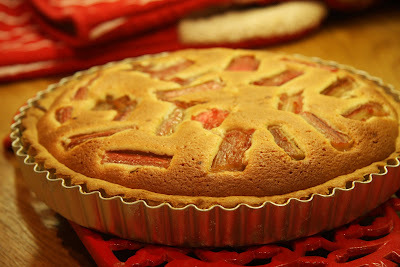 Bake for 20 to 30 minutes until the tart is golden brown and the frangipan is set. Serve hot or cold with lightly whipped double cream or clotted cream.